Take the photo in bright, even light. Use a clean unmarked original copy of the music. Lay the page flush on a flat surface. Include the full staff width in every photo. 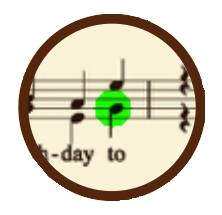 Align the music to the green guidelines. Hold the camera still while it clicks several times. It may help to use both hands and rest your elbows on the table. If the full page won't scan, try rotating to capture a half page. It may take several tries to obtain a good picture, even when all of these conditions are met. Please be patient. With practice, you will learn how to obtain pictures on the first try. Reading music is difficult, even for computers. Your phone needs all the help it can get! Your page might not readable. For more information, see the Document Requirements page. What's My Note? will accept imports of PDF documents or image files (JPEG or PNG). Note that this is most likely to succeed if the PDF was prepared by a publisher or using music publishing software. PDFs received as faxes, or scanned from a low resolution scanner may not be readable. Photographs must be high-resolution, and created under bright light. Press and hold the camera icon in the upper right corner of the view. Choose the photo you wish to import. This option allows you to see what note is currently bring played when you touch the music. 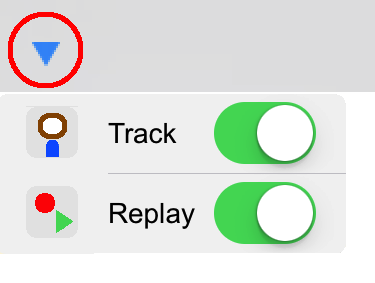 Settings are reached by tapping the wrench icon on the Playback view. Tap the Library icon to view the Music Library. Here you can view a list of all music you have entered into What's My Note? and choose a particular page to view and play. However, you can share your music photos among your own IOS devices. For example, you might photograph music from your iPhone, then play it on your iPad. (In such an arrangement, the iPad would not be required to have a high-resolution camera.) To enable sharing in IOS, enter the Settings App, find the page that starts with Airplane Mode, and scroll to the What's My Note? entry at the bottom of the page. Then turn on the switch labeled "Use iCloud (if available)". If you are having trouble synching, check out our iCloud page.